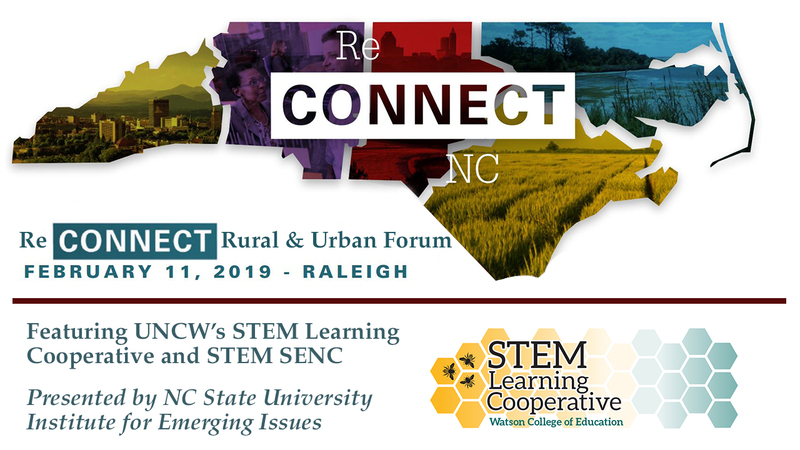 STEM SENC will be featured at the Reconnect Rural and Urban Forum in Raleigh on February 11, offered by NC State University’s Institute for Emerging Issues. STEM SENC is one of five community initiatives selected by the Institute for Emerging Issues to participate in the event, part of a three-year, six-forum series focusing on bringing North Carolina and North Carolinians together across lines of division. Selected communities are actively working on efforts to address shared challenges, and promote and more effectively leverage interconnections between different community types. STEM SENC was formed in 2018 to provide access to STEM learning opportunities for students throughout Southeastern North Carolina. UNCW’s STEM Learning Cooperative is a founding member of STEM SENC. Partners include representatives from area school districts, higher education, science-supporting organizations and the business community. The Reconnect Rural and Urban Forum will be held at the Raleigh Marriott City Center on February 11 from 9 a.m. to 5:30 p.m. More information and a link to registration are here. Leslie Boney, director of N.C. State’s Institute for Emerging Issues, authored an article about STEM SENC and the Rural and Urban forum. The op-ed was published in The Sampson Independent on January 24.